Turmeric paste is also popularly known as “GOLDEN PASTE” and the reason is obvious. There are so many recipes available to make a golden paste. The paste can prove to be super useful for both pets and humans. Can I Use Curcumin Instead of Turmeric Powder to Make Golden Paste? Does Black pepper In Golden Paste Cause Drug Interactions? How does black pepper/piperine increase bioavailability of compounds? What is black pepper/piperine’s effect on curcumin’s bioavailability? What is the average consumption of black pepper? What amount of black pepper is included in Golden Paste? Can dietary black pepper interact with your medicine? Can I Use Ghee (Clarified Butter) to Make Turmeric / Golden Paste? 70 ml cold pressed Olive or Coconut oil – Adding fats is another way to increase the absorption of turmeric in the body. Chose healthy oils such as virgin coconut to virgin olive oil. The above list of ingredients and measurements are taken from the golden paste recipe by Doug English. It is extremely easy and quick. Add turmeric to water in a pan. Heat gently along with stirring. Do this till you get a thick paste. This can take anything from 6 to 10 min. One great thing about this paste is you can keep it in a jar and refrigerate it. This will ensure you can make it once and use for a few days. Opinions vary on how long we can keep the jar, in our opinion, 1-2 weeks is okay. Not more than that. If while cooking your mix looks watery – you can add some more turmeric. No issues with that at all. On the other hand, if it’s too thick, add water. In case you see bubbles in the mix, it means that you have not stirred it enough. But don’t worry – do the stirring and after some time it will be all right. Note — The texture and “look” of golden paste does not impact its benefits 🙂 So do not worry if it looks a bit wired. we must warn you that you may not like the taste of golden paste (many do not) but do not worry. By the way, if you are still not aware of what all benefits turmeric has, here is a long list of turmeric benefits for your quick reference. 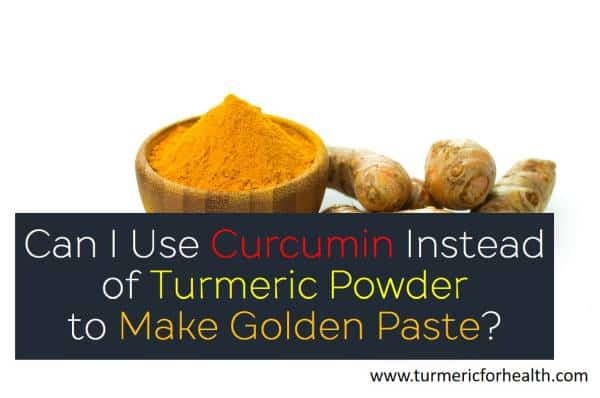 The answer is – No, you may not want to use curcumin powder instead of turmeric to prepare Golden paste. The reason is that curcumin has intermediate thermal stability and it may not withstand the heat for the period that involves cooking of the paste. Further, replacing turmeric with curcumin will lead to overdose (typically turmeric has just 3-5% curcumin). Moreover, turmeric powder has more to offer than just curcumin, and it contains curcumin in its natural state. Lastly, turmeric is inexpensive in comparison to curcumin powder. However, you can still add curcumin powder to your Golden Paste after it has cooled for that extra punch or for treating chronic conditions. Here are a few scientific details on curcumin’s thermal stability and how that impacts your choice between turmeric and curcumin for preparing Golden paste. If you have read our post Does Cooking Destroy Health Benefits of Turmeric and Black Pepper? You must be aware that curcumin has intermediate heat stability. Certain studies show that 85% of curcumin is lost within 15-30 minutes of cooking. Another study suggests that when curcumin is used as a food coloring agent, the temperature should not exceed 190 degree Celsius. Further, a study using a temperature range of 30-90 degree Celsius found curcumin to have intermediate thermal stability. Despite the cooking losses, curcumin is still transformed into beneficial therapeutic compounds. But we can aim to minimize such losses. The Golden Paste recipe is a DIY optimized way of getting the health benefits of turmeric at home. Curcumin has poor solubility in water, and this limits its absorption in the body. Golden Paste contains black pepper and healthy fats to improve the absorption of turmeric and curcumin. Additionally, the recipe calls for cooking turmeric with water to get a paste of uniform consistency initially. Cooking or heating turmeric is proven to increase curcumin and turmeric’s solubility in water. However, the cooking involved in Turmeric Paste may not be suitable for curcumin powder; it may degrade under such conditions. Another reason to use turmeric powder instead of curcumin is that turmeric powder has more to offer than curcumin. It contains curcumin in its natural ratio with curcuminoids, little amounts of turmeric essential oils and other therapeutic compounds. Also, organic turmeric is inexpensive in comparison to curcumin powder. We recommend using organic turmeric powder for making Golden paste; you can add curcumin powder to it after it cools. Golden Paste involves cooking turmeric with water on low heat to get a uniform consistency of the paste. This helps to increase the solubility of turmeric in water and enhances absorption. Since the heat is low and time involved in cooking is limited, heat losses are minimized. However, curcumin has intermediate heat stability. Cooking purified curcumin powder alone may cause it to degrade. Also, turmeric contains more therapeutic components other than curcumin. It is inexpensive as well. Therefore it is advised to use organic turmeric powder only for preparing Turmeric Paste. If you have purchased curcumin powder already, you can add it to the paste once it cools down and before consuming it. Piper nigrum or black pepper is a commonly used spice. Its pungency is imparted by the active constituent- piperine. Piperine constitutes 5-9% of black pepper. BioPerine is a standardized extract of black pepper that contains 95% piperine which is a natural bioavailability enhancer. Black pepper and its pungent principle-piperine are proven to stimulate gastric secretion and salivary secretion. Orally administered piperine is found to increase bile secretion in the liver. It is important to note that studies which show that piperine increases the level of digestive and pancreatic enzymes have used piperine at approximately 5 times the average amount included in the human diet. • It inhibits the activity of various enzymes that metabolize drugs. • It stimulates the activity of receptors in the intestine that absorb nutrients and other compounds. • It inhibits the activity of P-gp, a protein that detoxifies compounds and pumps out drugs from cells. • It decreases the production of certain metabolizing agents such as glucuronic acid which metabolize and eliminate drugs before absorption. Bano et. al report that 20mg piperine in combination with propranolol ( a drug used to treat hypertension) and theophylline ( a drug used to treat respiratory disorders) increases their concentration in blood and delays their elimination. 20mg of piperine is found to increase the bioavailability of antibiotics and anti-HIV drug. 15 mg of piperine is found to increase the sedative effect of midazolam. Similar results have been proven in relation to drugs like fexofenadine (anti-allergy drug), domperidone (anti-emetic drug) and anti-inflammatory agents like diclofenac sodium and ibuprofen. However, it just enhances bioavailability and does not affect the activity of the drug. Sama et al report the increase in bioavailability of an anti-hyperglycaemic drug by pipeline and this increased concentration potentiates it anti-hyperglycaemic activity without causing any side effects. In Ayurveda, traditional Indian medicine, black pepper is used to increase the bioavailability of herbal drugs. The first evidence dates back to 1928 in Pharmacopoeia Indica, where it is mentioned that long pepper was used to increase the anti-asthmatic effect of vasaka leaves. What is important to note that all these studies have made use of piperine and not dietary black pepper. So would it be appropriate to say that achieve the amount of piperine used in the studies we would have to eat quite a bit of black pepper? Keith Singletary in his paper ‘Black Pepper: Overview Of Health Benefits’ writes that consumption of black pepper in India is 300mg/ day which is similar to the consumption pattern of Americans. Piperine used in clinical trials is somewhere in the range of 10-20mg per dose. If piperine constitutes 5-9% of black pepper, that would mean consuming more than 200 to 400mg of black pepper per dose or ¼ tsp with every dose. Considering you need a minimum of two doses a day that would add up to more than daily consumption. 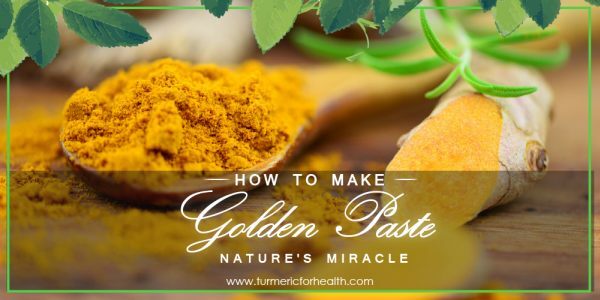 The Golden Paste recipe utilizes 3.5g for ½ cup of turmeric powder; we consume not more than 1-2 teaspoon of the recipe so the amount of black pepper consumed is far less to cause drug interaction in comparison to the amount used in clinical trials. Suresh et. al report that 44-63% of the piperine administered is not absorbed by the intestine and only 7-12% reaches the blood; however, piperine is absorbed in a larger amount than curcumin as per their study results. The only study that would answer this query is ‘Piperine in food: interference in the pharmacokinetics of phenytoin’ by Velpandian et. al. This study had three parts. In the first part, animals were administered phenytoin, an anti-epileptic drug with or without piperine 0.6mg. In the second part, six healthy volunteers were given phenytoin 300mg 30 minutes after consuming a soup that contained black pepper. In the third part, phenytoin was administered to animals via injections with or without administering piperine (10mg) orally. We will focus on the human study. 6 volunteers were asked to fast overnight and then given a breakfast with or without black pepper (1gram). 30 minutes later they were given 3 tablets of phenytoin of 100mg each. This was below the therapeutic value. 2 weeks later similar settings were prepared but this time a breakfast lacking piperine was served. Blood samples were collected both the times. Piperine content of the test soup provided for breakfast was 44mg (higher than regular dose). With the piperine, the absorption constant was 1.78 times higher than that without piperine. This rise in phenytoin levels could be due to inhibition of metabolism at intestines and liver. However, the rise in concentration was below the therapeutic range to cause the anti-convulsive effect. According to the researchers, with reference to epileptic patients who have a steady concentration of phenytoin in blood, pepper consumption could lead to increased concentrations of the drug and this may predispose patients to drug toxicity at therapeutic levels of phenytoin. Not to miss this point, the researchers do mention that the amount of piperine is slightly more than normal consumption. All in all dietary black pepper taken at a dose of 1g per serving ( higher than normal consumption) can increase the concentration of certain drugs in the blood. Dietary black pepper is likely to work as a bioavailability enhancer but that is dependant on the amount you consume. Studies that show that black pepper and its active constituent piperine cause drug interactions use amounts higher than that taken in regular diet. 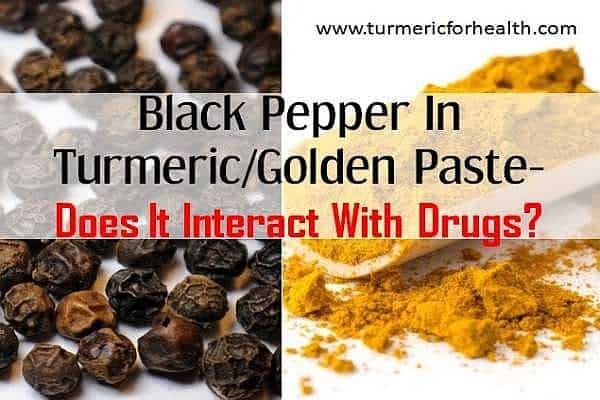 The amount of black pepper you would get from 1 teaspoon of Golden Paste would be far less than what is used in clinical trials and most of it is either not absorbed by intestine and whatever is absorbed works towards boosting curcumin’s bioavailability. The black pepper in Golden Paste may increase the therapeutic effect of a drug consumed right after it. It would be best to avoid taking drugs at least at a 2-4 hour interval from when you consume Golden Paste. The amount of black pepper in The Golden Paste is unlikely to cause any drug interaction, but dietary black pepper can still enhance the bioavailability of concomitantly consumed drugs. It’s best to avoid consuming any drugs immediately or at least till a 2-4 hour gap since you consumed the Golden Paste. 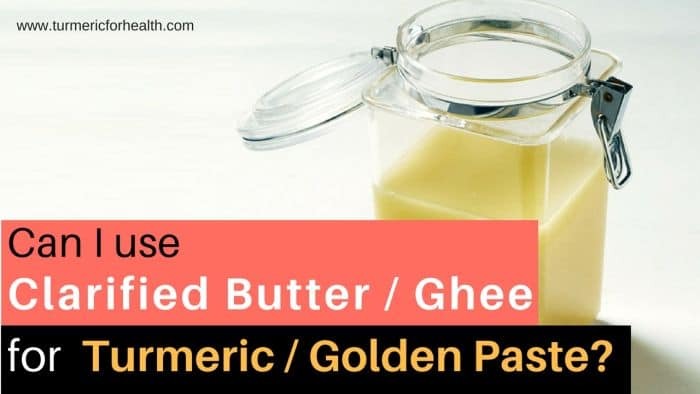 YES, ghee or clarified butter can be used to make the golden paste as it contains healthy fats. Ghee enhances the absorption of turmeric and has other health benefits compared to some vegetable oils. Ghee or clarified butter is a popular alternative to using cooking oil in many parts of the world. It is very popular in India. Turmeric has been used with ghee in many ways in India – Ghee is put in curries along with turmeric, ghee is also added to milk along with turmeric and so on. Now, let us discover the scientific aspect of why ghee can help in golden paste the same way as oil does. Ghee can be used because it’s not only healthy as healthy oils but helps in enhancing Turmeric’s absorption in the same way as oils do. To overcome this problem, turmeric is consumed with certain bioenhancers and compounds which can increase the availability of turmeric. Turmeric is poorly soluble in water but is soluble in lipids . Therefore, it is advised to consume it with healthy fats and oils. These fats and oils also serve as a base for the golden paste and facilitate its intake. Some studies have used turmeric with ghee, to enhance its bioavailability and assist in the treatment of health conditions. Thus, it can be said that consumption of ghee or clarified butter may facilitate turmeric absorption. Although turmeric is recommended to be consumed with lipids and fats for better utilisation, it is essential to determine the type of fats and oils used. This is because several fats and oils contain high levels of cholesterol and unhealthy fatty acids which can disrupt the lipid profile. They can raise the levels of cholesterol and triglycerides in the body. High levels of these lipids are usually associated with diseases like obesity, diabetes, metabolic syndrome, non-alcoholic fatty liver disease, atherosclerosis, and other cardiovascular ailments. Oils like olive oil and coconut oil are also healthy alternatives as they mostly contain saturated fatty acids, beneficial for health. One of the best ways to use turmeric is to make Golden Paste, one can make it using both powder and raw turmeric (recipe here). You can start with 1/4 tsp of turmeric powder to start with and then slowly increase it to 1-1.5 tsp per day. You can buy any trustworthy powder brand (spice). Just make sure it does not have heavy metals and other possible contaminations. If you are confused, here is a list of recommended brands from our side. Feel free to ask any queries on turmeric through the comments section below. Do not forget to share your experience of using turmeric with Ghee or otherwise. ! Do share your experience with preparing and using golden paste by commenting or emailing us! What os the simplest way of taking turmeric and black pepper? If I’m taking turmeric supplement, can I use the paste topically? Yes you can use the paste topically while taking supplements. To use turmeric topically, make a paste of turmeric powder and coconut/olive oil and apply it to the affected region. Please conduct a patch test first. Can you freeze Golden Paste without harming it so it lasts long longer? Yes, you can freeze Golden Paste. thanks for this articles. please visit our website to know more about turmeric and ayurvedic products. Is turmeric powder the same as curcumin powder? Turmeric powder is the powder prepared from whole turmeric roots and does contain curcumin while curcumin powder will be only a standardized extract of certain active components of turmeric (namely curcuminoids). Yes you can freeze the paste. How can u use a fresh tumeric with this recipe? How do you make the Topical golden paste? Hi. To use turmeric topically, mix organic turmeric powder with coconut or olive oil to make a paste and apply it over the affected area. Conduct a patch test before use. You have to be careful with Turmeric it stains your teeth horribly. You can’t just eat turmeric. I put it in capsules and also put it on the back of my tongue and swallow it fast with a gulp of water to prevent stains. I went to the dentist and they could not believe the stains on my teeth. I had been drinking turmeric tea for weeks and my teeth were horribly stained. I have had them cleaned and also rinsed with hydrogen peroxide for weeks and my teeth are better but never again no turmeric except in pills or gulping it. I’m thinking of taking tumeric, amalaki powder and ginger, 1 tsp each with a meal once a day. Do you see any issue with that? Trying to see if it will help with my non diabetic periperal neuropathy. Having a colon test per my gp doc suggested. The testing Doctor after test talked about my good health, you can return only if you wish to, your clean. I mentioned my induction of Turmeric cayenne and fresh ground pepper with also dried papaya seeds mixed with pepper in my grinder. She 1st said- Turmeric is a “Ground Floor Stimulant” meaning it stimulates normal function of the lower intestine. That is all she said about it. ( so why are you not taking Big Pharma ) why would I even think to consider when natural diversity has same if not true better results and no side affects causing a trap to more pharma ingredients. One thing in stimulating such, it is a good thing to clear the body of all toxins which Turmeric does very well. My suggest is little in the morn before work is okay -weekends when your home- easier to do house works etc and be close to home facilities if one is new to turmeric as it has that “Cleansing affect”. My only concern is – will in routine consumption of turmeric settle from being a rather great stimulant in the lower body cleansing?, if not a complete mouth to exit cleansing. Adding Cayenne also with black peppers can do much more great in colder seasons, – as blood cleansing, and great toxic cleansing. Our food sources are so harder to digest let alone chalk full of gmo items tricking our body to store. Routine use of turmeric itself with blk peppers or adding w/other herbs can increase improve all top to bottom health issues. Thank you for this site indeed. Hi. Thank you for the appreciation. Glad to hear that turmeric benefits you! How much of the golden paste should a person take each day? I blend & dry my whole fresh turmeric and then I powder it in my blender….the small amout that doesn’t powder totally I use in cooking and with my dogs and the other I make turmeric milk using 1/2 cup milk to 1 teaspoon dry turmeric with dash black pepper & 1 tablespoon of coconut or light olive oil with sweetner of choice & heat till warm. I drink this amount 3 times a day. My bones are deteoriating and I have severe osteoarthritis and had 2 operations in past 6 months for bone loss. It helps with pain and inflamation I know for sure. I take with food. Once paste is made, can I freeze in coffee bean molds to take, does freezing affect negatively?? Hi. Yes you can freeze turmeric paste in molds before consuming them. I buy turmeric root, fresh. I grate it, then cook it in water. After I put it in the blender with lemon juice, freshly ground black pepper, some honey, and a can of coconut milk. I blend this and because I use a large handful of turmeric root, it is a dark yellow. I drink a glass of this each day. I have not been doing this very long, so I’m not sure how it will work on my neuropathy pain. However, I recently heard that turmeric prevents alzheimer’s. I thought adding honey is not good ? It has been suggested I give this to my dog to help with allergies and itching. How much would you recommend for an 85lb 2 year old dog? do I have to use black pepper or can I use cayenne? Hi. Please use black pepper. I make a turmeric latte with 1/2 teaspoon of turmeric. Can I take a Caruso’s turmeric as well. Hi. Yes, its safe to use turmeric supplements when you are already consuming turmeric in the diet. However, it is advisable to use supplements only in case of chronic conditions. When you say, above, it is advisable to use supplements only in case of chronic conditions, do you mean supplements instead of paste? Or supplements with paste but only for chronic conditions? Thanks! Hi. Its absolutely fine to take supplements in addition to the paste but in that case lower the dosage of the paste. However, if you are taking really high dose supplements (4-8g) then you can skip the paste. How much should be taken daily? I have. ACV, tumeric, cayenne pepper and honey every morning before my protein shake. Should I add the oil to this? Could I use the paste and just add my ACV? Hi. You could use turmeric paste with ACV. One thing I forgot to mention. I take my golden paste with coconut milk. The taste is rather refreshing. My dosage is one teaspoon of golden paste 3X per day. I have been taking golden paste for two months. More energy. My candida symptoms are gone. Skin is not as “crepey”. My little nagging aches and pains are gone. I am more supple in my stretching and joints. Muscle stiffness has decreased dramatically. My memory is improving. I don’t grasp for words as much. Recall has improved. Better sleep. Hi Lew. Thank you for sharing this. Glad to hear that turmeric benefits you! And yes turmeric paste and coconut milk is a great combination. Hello, I have heard that you can dolop small pea size amounts onto a tray with say a decorators frosting bag, put in freezer until frozen, then store in a glass jar and keep in the freezer. Is this alright, and will I still get all the benefits of the tumeric paste doing it this way? I thank you for your response as I am new to this all. Hi Maryanne. Yes many readers freeze golden paste and consume frozen the frozen blobs like pills to avoid any taste. Also freezing the paste can help store it for a longer period. Hi. 1/4 to 1/2 tsp of cinnamom powder should suffice for the entire batch. 1 whole (chopped/cut in pieces) chicken. 1 sliced up yellow onion. 1 WHOLE bulb/head of garlic, smashed up. 2 beef steak tomatoes chopped up(quartered is fine). Salt and cracked black pepper to taste(plenty of pepper to help absorbed and make it spicy). Eat it with hot crusty French bread! Dip the bread in the sauce! 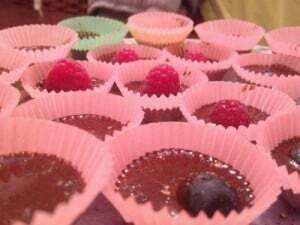 Hello, I want to thank you so much for this awesome and very beneficial article and recipe. My husband and I will be taking the Pastor every day now. I can put it in capsules for us, correct? What size capsules should we use please? And then how many capsules at once? I know that you recommend 1/4 teaspoon, so will all of that fit in one capsule? Thank you fo your assistance! I heard that you can rub the golden (turmeric paste) on painful arthritic joins like knees. Is this possible? Hi. Yes you can use turmeric paste for topical application in arthritis. You have to mix turmeric in olive/coconut oil to make a paste. Do not add black pepper. Please conduct a patch test first. The paste can be applied and massaged on the knees 2-3 times a day for pain relief. Turmeric may stain your clothes and hands so please use with caution. Is there any other way to use Turmeric as a way to control HBP other making the paste? Can the powder alone be used in other things such as orange juice, other juices, water w/lemons, etc.? What would the amount be and how often taken? We’ve just started using it, but only sprinkling it over salads, and other meals. Golden Paste include healthy fats and black pepper to improve the absorption of turmeric. If you are using the powder in juices, you can use about 1/2 turmeric powder and a pinch of freshly ground black pepper. Or you can consider juicing turmeric roots. You could also include in your cooking. You can use it to prepare a salad dressing as well. Dr Michael Mosley (UK health product myth buster), and the turmeric test. You can watch the trial online, or read the summary. Michael is my go-to guy for myth busting so called ‘miracle’ claims on superfoods. I can’t see any information on how much of this paste to take daily. Hi. Start with small doses such as 1/4-1/2 tsp of the Golden Paste and if you see no side effects then increase the dose gradually to 1 tsp 2-3 times a day over a few weeks. Best taken with food to avoid acid reflux. Avoid taking it at the same time when you take meds. I bought a jar of Tumeric with pipertine..900 mg Turmeric w/ 100mg Turmeric Extract and 5mg Black Pepper..1000 mg Total..I have Severe Lower Back Pain and 4 slipped disks. How many Capsules do I need per day? I’m a 55yr.old Female weighing 135 pounds. Thank you for your help..
Hi Teresa. The dosage would depend the severity of the condition. Start with the smallest dose which is 1000mg or 1 capsule a day and increase. A dose of 2000mg a day should suffice (at the most 3000mg or 1 capsule thrice a day after meals). However we would suggest confirming the dosage with your doctor to avoid any drug interactions. Please take the supplements after meals and maintain a 3-4 hour gap between taking turmeric and any medicine. Has any one tried using Coconut Oil powder instead of the cold pressed coconut oil? I’m looking for a longer shelf life for my golden paste. It also gives it more flavour. Was wondering if I have the turmeric root capsuls that are 500 mg can I just empty them out and follow your directive ??? As in open the capsuls?? Can I use the paste directly onto my painful achilles tendon on my right foot. The yellow staining doest bother me. I would then wrap my foot with cling wrap. What do you think? Thanks. What is the ideal cooking temperature to accrue maximum health/anti-cancer benefits? How do you keep paste from separating storing in refrigerator. What happens to the tumeric paste if you forget to refrigerate it.? Is it still good or do I need to make new paste? Approximately 2.5 ounces = 70/28.35 . However I highly recommend a kitchen scale and most cases you can simply use the mL for grams depending on the density of the ingredient. Is your recipe for non standardized turmeric powder? Hi, I have been recently diagnosed with UC and I would like to use Turmeric powder with hot milk at night as turmeric powder is easily avail. Can you please let me know if this is fine or I have to use golden paste only. Hi. It depends on the severity of the disorder. Both Golden Milk and Golden Paste are helpful. 1 cup Golden Milk can be consumed daily at night. If the symptoms are moderate to severe, Golden paste is a more a feasible option because you increase the frequency and dosage of turmeric. I very much enjoy reading your website and articles, many thanks for sharing your knowledge and research! I have been preparing (for several months) the Golden Paste only with Black Pepper and COCONUT oil, (no water). I cook it on an EXTREMELY LOW flame for about 7-8 minutes, what do you think? Should I cook it for less time? Do you think this method will work as well, as when it is prepared with water? Cooking turmeric powder in oil is a common practice in Indian cooking. Coconut oil can be cooked at high temperatures. The aim to cook turmeric in water in the paste is to increase its solubility in water and increasing its absorption. We would suggest following the recipe as mentioned. I like preparing GOLDEN MILK without the paste, I add 1 or 2 tsp of that paste to a cup of heated Almond milk, it is delicious that way and easier to consume! If I normally add dry Ginger, Cinnamon and Cardamom, do you suggest I add them toward the end of the process? However can you please provide a recipe for using Fresh Turmeric as this is my preference and its easily available, should I also use ground black pepper and coconut oil in this to help improve absorption ?? How do you use it? How much? (tsp, tbs, 1/4 cup?) How often? I wasn’t aware of the paste until now, and I have been using a damp (with water) Q-tip dipped into turmeric powder. Then I dab it onto my Oral Lichen Planus. Just started this but it seems to help calm it down. Any harm in doing this? Hi. No there isn’t any harm in applying the Golden Paste that you consume to oral lichen planus. This may help in reducing the inflammation. I’m wondering if it would be possible to use fresh turmeric instead of the powder, as I have a big batch of fresh turmeric currently. I know that it may not last as long this way but I was thinking of storing it in the freezer instead of the fridge. Would you recommend this? Or should I just use the powder? How do I know what 70ml looks like, please keep these directions in the same context since we are not on the metric system. Also, this is a great article, particularly the aspect of black pepper which many articles do not address. I find adding turmeric and black pepper to omelets is a good conveyance mechanism. Hi. That would be slightly more than 1/4 cup or 3.5 tablespoons of oil. Adding turmeric and black pepper to omelets is a good way of including the spices in diet. Every time I try to make tumeric paste (3 times now), it takes way more than 6 to 10 minutes to get a thick paste, should I increase the heat? Then when I try to stir in the coconut oil, it never incorporates, but always separates. What am I doing wrong? Hi. 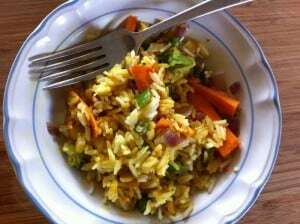 About the increased duration of cooking you may be using more water than the amount of turmeric powder that you take. No need to increase the heat; you can consider reducing the water. Ensure that you are using good quality unadulterated coconut oil. Let the paste cool down a bit and then add liquid coconut oil part by part to get a desired consistency. Addition of excess oil or a watery paste may cause the oil to separate. Hope this helps. What is the best way to take turmeric for oral lichen planus? Capsules or apply the paste to affected gums? Hi. Topical application is a must. You can make a paste of turmeric with coconut/olive oil and apply it 2-3 times a day to the gums. If you feel oral consumption of Golden Paste is not helping you then you can consider taking turmeric supplements. Thanks for sharing your thoughts about turmeric recipes. Hi. Turmeric does helps reduce inflammation in pancreatitis and should help pets as well. But it is best to confirm with the vet. Hi. That’s a great way to take turmeric paste. Thanks for sharing! I was advised not to use oil … so would taking turmeric be a waste of time and money? Hi. Yes this is a good way of making turmeric milk. It is safe to consume daily. Do keep us updated on how this works for you. Is there a method to make Golden Paste in the microwave? Hi! What is a good daily dose of the golden paste? You can take Golden Paste. Start with small doses such as 1/4-1/2 tsp and if you see no side effects then increase the dose gradually to 1 tsp 2-3 times a day over a few weeks. Best taken with food to avoid acid reflux. Thank you so much. For me, I may have a re occurance of my oral cancer involving lung. Biopsy yesterday. Wife starting chemo next month for leukemia. So anxious to do this. I realize I’m a little late to the game but I’m so sorry to hear this news. I pray that both of you are getting better and that your cancers vanish fast. If you did/are using Golden Paste for either cancers, is it helping? Can the paste be topically applied over an inflamed tendon? Yes I literally just did that to my ankle and over night it fixed the pain and most of the swelling! Hello, you mentioned that one woman was not getting results because she was taking turmeric with honey. For me, I mix organic turmeric powder with ginger and garlic powder in warm water, then I add honey for taste. I’m I doing something bad? Hi. Please link back to the article where it has mentioned that honey may affect turmeric’s benefits. We don’t remember mentioning this. In fact Ayurveda recommends making tiny pills of turmeric with honey and use them to cure some health conditions. You can add honey for taste. Just take care that your daily sugar intake (even honey) is not in excess. or must be organic turmeric powder?? Hi. You can use turmeric spice powder if you are sure of its origin and quality. Also it should be turmeric powder alone and not a mix of other spices. The reason to recommend organic is to avoid chances of toxicity or heavy metal contamination. Since honey has self preservation qualities, it never goes bad, has then been a Golden Paste recipe with added honey to promote longer shelf life? Hi Mike. That is an interesting point and thank you for sharing it. We have not examined the preservation properties of honey but yes to improve the taste we do suggest taking Golden paste with honey as long one keeps their sugar intake within limits. The black pepper and turmeric itself aid in preservation and the paste can also be frozen to store it over a long period. I bought. 3.38 oz curcumin 95% before research. In the golden paste recipe is this what your using? Hi. In the recipe we have mentioned organic turmeric powder not curcumin. Curcumin may not withstand such high temperature for long time. Please use organic turmeric powder to prepare the paste. Once the paste is prepared and cooled, and after oil and black pepper have been added you can mix 1-2 tsp of curcumin to it. This will add to the benefits and the curcumin will be utilized as well. Hi, instead of making the golden paste with pepper and all the other ingredients would having just 1 tsp of turmeric with honey and warm/hot milk be beneficial at all? Hi Shaleen. That is absolutely fine. You can boil 1 tsp of turmeric powder in milk and add honey. 1-2 cups day is fine. Please ensure that your sugar intake (even honey) should not be in excess. morning. Does anyone know if I can drink more than one glass a day safely? Hi. Your site (and others) recommend taking turmeric organic powder at the dose of roughly 1-3 teaspoons per day for general health maintenance, which is felt to be safe and from from side effects. When using your Golden paste recipe using turmeric powder, as noted above in this article, how much actual turmeric powder would be present in each teaspoon of your paste? In other words, would 1 teaspoon of your paste be equal to 1 teaspoon of the powder? Thanks! Hi Justin. Nice question. 1 tsp Golden Paste would approximately contain 1-1.5 tsp turmeric powder. The oil binds it together so the quantity looks less than what dry turmeric powder would appear to be. Im assuming that since i posted a previous comment i won’t have to repeat!! Im in America ,and I see the use of metrics for the most part,; im able to convert that. ??? I buy tumeric,black pepper,and Olive Oil at my local grocery store. I plan to make this GOLDEN PASTE, and use it as I’ve done previously. ARE BENEFITS STILL THE SAME?? Hi. Thank you for your feedback in the previous comment. We hope we are getting this right: the guidelines and measurements mentioned in the article are amenable to changes. There is no exact ratio as such and minor changes are possible. Including these 3 ingredients in a meal also does the trick. The benefits are the same. Only if you looking forward to a more therapeutic dose, then you have to consume Golden paste 2-3 times a day apart from including it in meals. Hope this resolves your doubts. Let us know if there are any other queries. When the tumeric paste is cooled is it ready to use? Yes, after the paste is cooled, it is ready to use and you can store it as well. I have been using 1/2 teaspoon tumeric in hot tap water with 1/4 cup orange juice and 3-5 turns on the pepper mill. How much black pepper should I be using? The orange juice masks the taste and drinking milk with breakfast keeps the pepper from burning my mouth. I do this for joint pain and inflammation everyday. I hope I am doing it right for it to be an effective pain killer and inflammation reducer. Please let me know how much black pepper I should be using. My evening meal I fry my fish or chicken in a tablespoon or two of olive oil and shake tumeric and grind black pepper along with grinding basil for taste onto my meat. I don’t know how effective this is. I would like to know this too. Thank you. Hi. It is a great start to include turmeric in diet. It can help reduce inflammation. There is no specific amount of black pepper recommended; for 1 teaspoon of turmeric powder 1/4 to 1/2 tsp black pepper powder may suffice. Including turmeric in diet can help improving overall health but if you have significant pain and inflammation in the joint it is advisable to take Golden Paste on a therapeutic scale. You can include Golden Paste in milk or juice or smoothies to mask the taste. making turmeric paste it just heating all ingredients, but not bringing them to the boil? Am I right? I have a dog with oral melanoma. Can I feed him the golden paste instead of applying it as the tumor is in a hard to reach position? Also is the paste suitable for dogs with kidney stones (calcium oxylate)? Thanks!! Yes, you can give your pet Golden Paste instead of/along with oral application. However if there is a kidney stone problem, then it is important to note that turmeric as a spice as high levels of oxalate. So it may not be safe to give golden paste to dogs with kidney stone issue. If he does have a kidney stone issue then it is best to stick to oral application to the spot. Hope this helps. I am very much glad like this help for me to provide the most important information about the termeric help. I am have SPH problem and I am applying turmeric paste around 5 minutes than washing it. Is any help with this. I am have Gynacomastia problem age of 29 little obese. Please help me I need really.best wish and hope I will get reply. Hi. Could you please mention more about this disorder. For topical application we recommend a paste of turmeric and coconut/olive oil and let it stay for at least 20 minutes. You can take Golden Paste for obesity. Start with small doses such as 1/4-1/2 tsp and if you see no side effects then increase the dose gradually to 1 tsp 2-3 times a day over a few weeks. I am badly impacted with lipomas, almost everywhere in the body. Please let me know is this golden paste will cure them , if not cure atleast help to reduce the size of existing lipomas and stop formation of new lipoma. Hi. We can’t exactly guarantee that turmeric will cure lipoma. You may require to take curcumin supplements to control this condition in addition to Golden Paste. We have outlined a dosage for cancerous conditions and this can be utilized for non malignant conditions as well till a tolerable dose (say 4g) or till benefits are perceived. Please consult a health practitioner before starting turmeric therapy and also to asses your condition and get an opinion on the same. Avoid taking turmeric supplements on an empty stomach and the same time as medications. Maintain a 3-4 hour gap. I read the article on cooking turmeric which answers my previous question. Could poorly absorbed turmeric have one advantage– that it would have a greater effect on the colon? Hi. That is an interesting question. But apart from not being absorbed, turmeric is also rapidly excreted when taken alone so it is hardly likely to impact any tissue significantly. I was told to put 1 tsp of organic turmeric, 1 tsp cinnamon, 1 tsp freshly ground black pepper, and about 2 to 4 tho spoons of raw honey in a glass jar mix well then refrigerate. Take 1 tsp a day either with warm water mixed in or by itself. I’ve been just taking a tsp full because it seems to not mix well, the cinnamon and pepper sinks to the bottom. The friend who told me this says him and his wife are seeing results after a few days. He has been on this for 1 month and has lost from 250 to 236. I lost 3 lbs the first week, but it has done nothing for me in the last two weeks. What am I doing wrong? Hi. We would advise you to make the Golden Paste. It has all of the ingredients you mentioned (you can add 1 tsp cinnamon powder to the entire batch). Turmeric is better absorbed in the body with fats and/or black pepper. You can take this with honey if needed. Turmeric accelerates weight loss outcomes of diet and exercise. Mix 1/2 or more teaspoon turmeric powder with oil and ground pepper. Mix that into a glass of kefir. Is this ineffective since the turmeric is not simmered in water first? Hi. That is absolutely fine, Oil, black pepper as well dairy fat in kefir aid in absorption of turmeric. Is it ok to store it in a plastic airtight container or must it be in a glass jar? Glass is preferable but if you don’t have one, airtight plastic container is fine for storing Golden Paste. Hi I have just made a Tumeric Paste but have used shwartz ground black pepper 1.5 teaspoons in the quantities in your recipe. I note that I have used pre-ground black pepper that may have lost potency etc. Do you think it will still be effective or do I have to start again, or even put it all back in the pan and add fresh ground pepper? What do you suggest. I am taking it as I have swollen glands at a the base of my throat and have had a cough for 4 weeks. After doses of garlic cider vinegar honey and aloe vera tonsil swelling has gone down but glands still need some help. Can you please let me know. I don’t want to take a useless paste! Thank you in advance for your response. Hi. If the ground black pepper has not been stored for long a time and still gives the characteristic aroma then it still does have piperine and can be helpful. It is absolutely fine to use this paste for this time for the cooking and fats will help in absorption as well as the black pepper to some extent. Next time do try and use freshly ground black pepper. Hello thank you for the post. My brother has eczema. He has totally given up hopes that it can be cured. It is irritating him very badly. I know that it is not curable but it would be of great help if you could tell some ways by which his skin irritation could be lowered. Also will the marks on the skin perish?? Can he apply the paste on his skin directly(any side effects??)?? A good way to overcome eczema is to cleanse the gastro-intestinal tract. I have used alkaline mineral rich water (9.5 pH) which is produced by ionization. It works great and has saved me much skin rash misery. A book to help with all health issues is “EAT DIRT” by Dr. Josh Axe – fantastic. Hi. Research does prove that curcumin and turmeric protects liver health and relieves pain. It is also an anti-obesity agent. However you could consult a herbalist or naturopath for further confirmation as to how turmeric would benefit your health condition. The suggested dose of Golden Paste is 1 tsp 3 times a day. Start with a low dose such as 1/4-1/2 tsp a day for a week and increase gradually over the week if no side effects are observed. Best taken with meals and avoid taking it at the same time as taking medications. I made the golden paste and it is tasteless. Also, it contains some plastic-like or cardboard-like particles. I’m going to toss it out and continue to use uncooked turmeric mixed with black pepper, olive oil, and a dash of salt. Hi. No clue why the Golden Paste should have ‘plastic or cardboard like’ particles. Please check the quality of turmeric. Including turmeric in diet the way you mentioned is absolutely fine. Hi. Can black pepper essential oil be used? Hi. It is preferable to use freshly ground black pepper as it contains piperine which helps in absorption of turmeric and may not be present in black pepper essential oil. While I know very little about the golden paste, I do know that one supplement lecithin aids liver recovery extremely well, best to build up if not used before from a desert spoon to 2 heaped desert spoons a day. An acquaintance’s daughter was in hospital with a messed liver & not getting better, – a week after starting the lecithin she was fine again. Thank you for the awesome blog ! I’m looking for inofrmations on turmerci lately and this is very helpful. Why make turmeric paste ? What is the difference with simply adding grounded turmeric, pepper and oil to your milk / dish / smoothie? Hi. Thank you for your feedback. Turmeric paste has been developed with the concept of being able to take turmeric for therapeutic reasons in bioavailable form at home. When you are looking for relief from a particular condition it is difficult to consume large proportions of turmeric to get enough beneficial components. Also consuming plain turmeric powder is not that helpful as curcumin found in turmeric is poorly absorbed in the body. Golden Paste takes care of these components. As you suggested it is absolutely fine to add all 3 or any of the 2, turmeric, black pepper and oil in your dish as well. That is equally effective. But if you intend to take large doses, Golden Paste is more convenient. I am taking Plavix and would like to take turmeric paste as well but I understand that it thins the blood, does anyone have any info on this. Thank you. Turmeric has anti-platelet activity but no human study proves this. Dietary turmeric is relatively safe and some readers do take it even when on anti-coagulants. But it is best to consult a herbalist or naturopath about this. is it safe to take GP while on doxy,flagyll and ciprofloflaxin drugs?seeing the caution with drug interaction. Dietary turmeric is safe. If taking a large dose avoid taking it close to the time of taking other medicines. You may consider consulting a herbalist or naturopath with regards to this. 1. Can I make in smaller batches (like half of the recipe) since i found that I cant consume the entire recipe before it goes stale? 2. When I take the paste, I roll them into small balls, put them in my tongue then swallow with water. In this way I cant taste the paste. Is this alright? 3. How long should I use it before I can see results? Hi. Yes you can make smaller batches and reduce the ingredients approximately. Rolling it into balls is fine to skip the taste. Some even freeze it in silicon molds or ice cube trays and swallow 1 as a whole with water. The dose that we recommend is around 1 tsp 2-3 times a day. Some may need more some may need less depending on the condition and how much your stomach tolerates. If you are getting at least 1 tsp 3 times a day in the form of the small balls or pills that you make, benefits should be evidenced as early as 1-2 weeks. I read the recipe for the Golden Paste. Rather than adding water and heating it, I just put 5 parts turmeric, 1 part black pepper, and a little sea salt for taste in a small glass. Then I add enough olive oil to stir and make it into a thin paste. Do you see anything wrong with making it this way? It sure is easy! Hi. That is absolutely fine. However by cooking turmeric paste you increase its solubility and absorption. I take the powder mixed with 1/2tsp of peanut butter & pepper. I grow my own & eat it raw with the peanutbutter & pepper. only the taste of peanut butter is there. Have you read Adverse Reaction to Ciprofloxacin and/or Levaquin. They can be devastating to some people. I was prescribed Levaquin 750 mg for bronchitis in 2001. On the third day (5 ), suddenly I could not walk or stand. All tendons and muscles from hip down, including my feet were affected. It has been very bad. I’m fifty percent improved in 2017. Still have peripheral neuropathy, tendinitis and tendonopathy. Please be very careful!!! Hi. Is it safe to take GP as a preventative and if yes how much should i take. I have read on a turmeric user group that if you have no ailments you should not take GP as it can be harmful,but use the turmeric powder instead. Thank you for your answer. Turmeric and black pepper are spices and coconut/olive oil are used in diet as well. Golden paste is made of these components and regular consumption of these benefit health and are safe as well. Just bought some fresh tumeric and want to make paste ahead rather each time I want golden tea or milk. I can grate it and mix it with ingredients such as coconut oil, etc. What do you suggest? I have been taking two tablespoons 2-3 times per day? Is this too much? Could it cause any problems? I feel fine, but just want to make sure. Turmeric as a spice and in diet is safe. The ideal dose differs from person to person. If you are taking two tablespoon 2-3 times a day and not facing any gastric side effects or any other side effects then that is fine. Many readers do report taking around the same dose. Turmeric up to 8g has found to be safe in study. If you are skeptic then you can stick to 2 tablespoon twice a day. Can someone please provide some feedback ?? Why do you think that the paste should only be stored for a couple of weeks? – does curcumin break down particularly?….Or pipeline in the pepper?…what if one were using extracts rather than simply relying on the small amounts in the whole spices? Food without preservatives do deteriorate and lose freshness over time. Therefore we advise to consume within few weeks and try to get as much as fresh paste as possible. Also piperine is a volatile compound. Whole turmeric powder has much more to offer than turmeric extract but it is a personal choice. In an attempt to extend the efficacy of Turmeric Paste, I put warm paste in 1-pint Mason Jars and then vacuum seal the lid, and refrigerate. I have left it this way for up to 3.5 weeks. I haven’t smelled or tasted any difference between 3.5+ weeks and 1-week old, Turmeric paste kept in a refrigerator. Maybe it is losing some nutrients, I would like your opinion. Hi. It should be fine if stored under air tight conditions. Any change in color and smell should be first indicators of freshness. Since it has been refrigerated there should not be much loss of the nutrients. For how long should it be good in the freezer? 2-3 weeks in the freezer should be fine. Hi. Both Ground turmeric and whole turmeric powder is the same. You can check the ingredients list to confirm that if its only turmeric and not other spices. Hi, I am courios about some cancer doctors says that it is better to cook turmeric in an olive oil (20-30 secs) to get more benefit from turmeric comparing cooking in a water first. Could we make turmeric paste first cook turmeric powder in an olive oil than adding water and pepper later? Hi. Turmeric is soluble in fats hence it is always advised to be cooked with oil. Cooking turmeric with water also increases its solubility in water and then adding oil enhances the absorption.We recommend you follow the recipe instructions. Hi I would prefer taking the turmeric in a pill form. What is the suggested mg and do I need to take the pill with anything to increase the absorption? Most turmeric supplements contain piperine/bioperine or lipids for absorption. The ones that are commonly available are standardized 95% curcumin extract with bioperine. The dose depends on the condition you are treating and it is best to consult a herbalist or naturopath about this. Instead of refrigerating the paste, can you freeze it in ice-cube trays and use one cube a day? Will it last longer this way and be as effective? Yes that is absolutely fine. Many readers do take frozen turmeric paste as a cube daily. HI Can I make golden paste with ghee instead of coconut oil? I have both. Would like to know if either or is ok or if one is preferred over other? Yes you can make Golden paste with ghee. The current evidence that ghee is safe for heart health so there is no concrete reason as such why either of the two should be preferred. Either should be fine. However one precaution is that Ayurveda recommends not to mix honey with ghee so if you make Golden paste with ghee avoid taking it with honey. There is no research to prove this but it is a safety measure that you could practise. I have been eating 2 eggs scrambled and cooked in a fry pan with coconut oil, about 1/2 teaspoon of powdered tumeric purchased in bulk from local inexpensive grocery and oatmeal cooked usually in milk, with about 1/4 cup frozen blueberries and 1/3 teas ground cinnamon (again, from bulk grocer). Sometimes I add nearly 1/4 cup of Greek Yogurt made without sugars etc on top. Now that I read about the pepper and tumeric combo and its benefits, I am wondering how much black pepper to add. My peppercorns are in a grinding mill which usually grinds course. Should I use a spice grinder (small coffee grinder–(I don’t grind coffee beans nor drink coffee), and grind the peppercorns into a fine powder or nearly a powder? Also, you mentioned pepper peperine losing its effectiveness . How long would that take? You said not to use ground pepper (pre-ground I believe you meant). You also talked of how long the Golden Paste would last. Therefore, I imagine the peperine would still work its magic up to at teast 2 weeks. One last question: I take several medications. 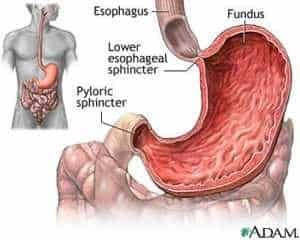 I have Barretts Esophogus syndrome and take 1 omeprazole each morning to prevent acid reflux (Mine was silent) to keep Barretts Esophagus from advancing. I also take 2 – 3 times per day, a med for ADD, 2 different anti-depressants and 1 type of anti-anxiety pill, along with one allergy pill (Allertec, a Zyrtec knock-off). How would all these interact. I want to get off the anti-depressants and anti-anxiety pills but that will be a process. PS, I eat my breakfast immediately after my first morning dosage of all the pills mentioned. Hi. Nearly a powder or coarsely but freshly ground black pepper is fine. The texture does not matter as much as the freshly ground aspect. Piperine is the compound that imparts pungency to black pepper and helps with absorption of curcumin. It is volatile. That is why we suggest not to use pre ground pepper as it loses its aroma and pungency which would mean loss of piperine. Golden Paste has piperine and oils cooked in it so they are integrated and hence last fresher and more therapeutically active than stand alone black pepper or piperine. Dietary turmeric does not really interact with medicines but it is the black pepper which is of concern. So it is generally advised to maintain a 3-4 hour gap between taking GP or turmeric supplements and any other medicine. But since your breakfast does not include black pepper in large amounts it should not be an issue. Dietary turmeric is great and you should continue it but for a more therapeutic effect we suggest taking Golden Paste. I have fresh turmeric roots..I cut them into pieces and mix them with a glass of milk,5-6 tbsp sour card, 10 black peppers,1 tbsp extra virgin olive oil in a blender and drink it before going to bed.. I have a few questions regarding this..
1) is the proportional ratio of the ingredients accurate? 2)should I use the extra virgin olive oil?if it is right using oil in the mixture then what will be ideal between organic olive oil and coconut oil..? 3)can I refrigerate this mixture for 3 days? Hi. Fresh turmeric roots do not require any additional elements for absorption. They contain natural oils for absorption of curcumin. If using fresh turmeric powder then you have to use black pepper and oil. There is no fixed ratio as such. Please make this fresh prior to consumption; it is difficult to comment on the storage aspect. 1 suggestion would be that you prepare Golden Paste and store it. You can mix this with milk or curd just prior to consumption. How much paste should a person take each day and why fresh ground pepper instead of ground pepper ? Start with small doses such as 1/4-1/2 tsp of Golden Paste and if you see no side effects then increase the dose gradually to 1-2 tsp 2-3 times a day over a few weeks. 1 tsp of Golden Paste 2-3 times a day is the ideal dose but could differ based on your requirements. Freshly ground black pepper is advised because its active ingredient piperine is volatile and is required for absorption of turmeric. This may be lost in ground or stored black pepper. Turmeric has immune regulating properties that can benefit in multiple sclerosis. If your son’s weight is close to average adult weight (this is in relation to the height you mentioned) start with 1/4 tsp a day for a week and if no side effects are observed increase by 1/4 tsp every week. The ideal dose would be 1 tsp thrice a day. However turmeric is not meant to replace medical advice and you could consider getting a second opinion on this and also using turmeric as add-on therapy. My kids Doctor said the further away from the equator, the higher the incidence of MS and other diseases due to lack of Vitamin D. (Rickets and has also sky rocketed). I would strongly recommend getting him on Vit.D, and you too, it did wonders for my mood and PMS. Hi. We are glad to know that turmeric benefits you in MS. Wish you good health. You may want to check out Fred Bisci on-line his nutrition has helped many, myself, my friends. Also spirituality, religion, God is very important for all of us and if do the research provides better health especially when trying to deal with issues of any size. Prayers and well-being to you and your son. Look to vaccines for the cause of MS and autism. I want to make this ahead of time, almond milk, coconut oil, turmeric, pepper and cinnamon first heated to a simmer and then refrigerated as I drink it in the mornings. Yes when refrigerated this should stay well for 3-5 days. But to be on the safe side- any change in odor, appearance or taste please discard. Hi.I just bought turmeric powder in mall, it’s ingredients are turmeric extract, sugar,honey,mangosteen, lemon grass,guyabano,malungay banaba ,lagundi,sambong and black pepper .Is it okey to use for weight loss? Hi. Based on the ingredients, this is not pure turmeric powder. Its sugar and honey content may impede your weight loss efforts and we can’t comment on the safety and utility of other ingredients. I have been reading recent research seems to indicate that since curcumin (the active ingredient in turmeric) metabolizes so fast, taking it with amino acids (proteins), piperic acid (black pepper), acetic acid (vinegar) or any other acid can result in its easier uptake by carrier proteins in order to delay its metabolism in the cells. This would indicate that it should be taken WITH protein meals or at least vinegar as opposed to milk (alkaline) or water. Does that sound familiar to anything you have found? Hi. This is a pretty interesting find. Since this study is done at a molecular level we can predict its clinical relevance in bio availability. However curcumin’s bio availability is increased by piperine (the molecule from which piperic acid is derived. Whether curcumin thrives better in acidic environment or alkaline, is something that would need more research. Curcumin is insoluble in water at room temperature. And as far as milk is concerned curcumin can bind either to milk proteins or dairy fat and still be absorbed in the body. How much of this paste would you have to take to get the 5g of turmeric daily? Also would be be fine to have straight with water? 5g of turmeric would be close to 3 teaspoons a day. It would be difficult to give an exact amount. However it is advisable to start with a small dose and gradually build up the dose to 1-2 tsp 2-3 times a day depending on how it suits you. Yes its best to have it straight and you can consume water after taking it. Hello I am currently 32 weeks pregnant. I am working 32-40 hrs and I have sciatica, but I have a stool and I constantly have to stand up and walk a short distance. I am trying to make it to 36 weeks. What is the best way to make turmeric paste? By mouth or to rub it on at the origin point? Michelle it is best to use both. Turmeric is traditionally said to work as uterine stimulant so turmeric supplements are not advised in pregnancy. Asian women continue consuming turmeric in diet so we would suggest limiting intake to less than 1/2 tsp a day in divided doses. Turmeric milk is a good remedy for pain, infections and also great for baby’s health. You can also mix turmeric with lukewarm oil (olive/coconut) and apply it topically for muscle pain relief. Conduct a patch test prior. I make my own paste. 1 Tbsp raw Turmeric, 1 Tbsp virgin olive oil, enough black pepper to make it taste pretty hot, maybe a quarter tsp and half a Tbsp of natural peanut butter. I do not heat it up or cook it. I consume it once a day for breakfast. I would like to know the importance of cooking it or not. Cooking turmeric increases its solubility in water. However the mix you are making has fats and black pepper for absorption of turmeric. Cooking is not a necessity when you include fats or black pepper but is beneficial. Is it the turmeric powder that makes it expire after 2 weeks? I made the recipe above and it’s been in the fridge for about 3 weeks and I’m still eating it every day. What goes bad? And how dangerous is it to eat once expired? Hi. Its not turmeric powder that makes it go bad but any food stored for long periods of time goes stale or loses its aroma or potency. However this also depends on the climate you live in and refrigerating conditions. People do store the paste for 2-3 weeks. The aroma, color and taste are good indicators of how good the paste is. There is no expiry date as such but if you observe changes in these parameters then it is best to discard it. Hi. i have tumeric root. Can I make the milk with the root insted of the powder? Yes you can prepare turmeric milk with the root. For that take 1 cup of water and add crushed or grated turmeric root to it. Boil for around 10 minutes to get a good extract. You can then add milk to this and a sweetener if you like. Yes turmeric in milk or water can help in weight loss if combined with diet and exercise. Hi everyone. I was wondering if someone had a mini recipe for golden paste? The listed recipe above is just too much for us. I end up throwing it out…..and I hate wasting anything. I’m looking to make about a TBSP of the paste at a time. I’m just unaware of the ratio amount for the listed ingredients.? Anyone??? Hi. You can take 1 tsp of turmeric powder, 1/4 tsp of black pepper powder and sufficient oil to get a paste like consistency say 1 tsp. There is no ratio as such but this should help. i just mixed the recipe but wasn’t paying attention and mixed all the ingredients together and cooked for 6 minutes. Hopefully, it will be okay. Yes, thats fine. It happens once in awhile. Curries are prepared in a similar manner and hence he mixture is safe to consume. Next time do add black pepper and oil in the end after cooking. Hey what if you have issues with black pepper what can be used? Hi. If black pepper does not suit you, then you can take turmeric with healthy fats only like olive or coconut oil. They help in absorption as well. just adjust the measures from cups to tablespoons or teaspoons will be same results. I suggest you buy coffee bean moulds and fill with GP then these can be frozen and will keep for months. can we make this in a nutra bulllet as a smoothie? I did that yesterday using the small bullet and used A LOT of fresh ginger. I then strained the mixture and heated it up. When making my morning blasts I typically include some turmeric in the mix these days. I am new to Tumeric. I have a degenerative spine condition and crohns. From what I understand, I can make a cup of tea with 1/2 teaspoon tumeric and 1/2 tsp ginger and organic honey. Will I also need to add pepper? Or will ginger take it’s place in aiding absorption? I am not a pepper lover. Also is tumeric paste just as good as the powders to make tea? I am simply wanting an effective tea I can make several times a day. And lastly how does all this compare with Turmoil capsules? Yes you can use ginger in place of black pepper in tea to take care of the absorption. Golden Paste is more potent than turmeric powder but how it would compare with the effectiveness of the tea depends on the magnitude of pain, dosage and individual experiences. Either ways both should help attenuate the inflammation but avoid taking either on empty stomach. Turmeric oil may not have as effective powers as powder in inhibiting pain and inflammtion as powder, but yes it definitely has medicinal properties including anti-inflammatory. I have a basic question. Can we use the Fresh Turmeric Roots(not dried ones) and grate them or grind them to make this paste. How long does this paste last for in the refrigerator? Are fresh turmeric roots less effective? Hi Shivaraj. Yes you can use fresh turmeric roots. They are very effective by themselves in terms of health benefits but if its a particular ailment you are targeting then you may need to optimize turmeric intake. Fresh turmeric can be grated or ground into paste. This should last good for a week when refrigerated. You could even make a pickle out of fresh turmeric for better storage. I usually just take powder tumeric and add it to capsules. So could I just mix black pepper to my powdered t umeric an add to the capsules without making a paste? My mom had turned me on to the paste several months ago and I can honestly say I’ve been using it ever since… I suffer from Fibromyalgia and sciatica and I am on the max dose of lyrica which helps don’t get me wrong but there was still a lot of discomfort and achiness in my joints! After many attempts with different “fads”, along with pain pills(which I really don’t like long term due to their addicting qualities), I decided this was the only thing that really did help! I’m 100% convinced that this was the missing link and I don’t think I could ever go back to where I was. Take your favorite coffee mug and add about 1.5 tsps of the Golden paste(your body can only absorb small amounts of tumeric at a time so it’s better to use smaller amounts of the paste and drink 2-3 cups of the tea a day). Fill the mug about 3/4 of the way with the milk of your choosing. Put in microwave for about 1 minute to 1 minute and 20 seconds. If it’s not hot enough to your liking, add 15 seconds at a time until it is. Take mug out of microwave. Add honey or agave to sweeten to your liking and also a small pinch of cinnamon to your drink. Stir well and ENJOY!! I very much enjoy this drink(some supplements aren’t quite as tasty!! haha) and I hope you do too… And please feel free to twerk this recipe around however you’d like. The only other thing I’d add is to make sure you purchase a good quality tumeric for your golden paste as it will effect the amount you absorb! I too have fibromyalgia among other things and also on lyrica and naproxen. I’m happy to see you’ve had some success as I’ve just heard of golden paste! Read all the comments and suggestion.. but i have many doubts and need clarification, please light..
My hubby is suffering from slipped disc and scitica pain on right side of the leg, with massage n pain killers pain does settle but for few hours, also his posture not straight and tilted to one side, which makes his one leg shorter than other because of dis-location of the disc. 1) So does having this golden paste will be able to place the disc on its original place? 2) For how many days or weeks or life long it needs to be taken and what should be it’s ideal amount? 3) He also has high and Low BP problem, in starting he diagnosed with High BP but after two years now he has low bp, though he is not on any medication but reduction of salt or any ups-down in normal daily food makes his hands, legs and face cold and numb, unable to attain speech, red eyes, this happened with him once.. Does intake of this golden paste will effect his BP levels or can help him to cure. Hi Shagun. Golden Paste will help relieve the pain and inflammation but for disc realignment a doctor or physiotherapist or yoga expert can help you. Initially he may have to take frequent doses of the paste and the changes will be evidenced as relief in pain and better mobility. Pain relief may be visible as quick as a couple of hours or may even take a week. After sufficient relief he can lower the dose of the paste. It is also safe to take this paste for life for it will only benefit him. Curcumin found in turmeric actually lowers blood pressure when taken in high doses and is used to reduce BP. But this should not be the same effect in your husband’s case because primarily turmeric has lower curcumin levels than supplements and secondly it will be targeting pain and inflammation. Since there is not much evidence on this we can’t confirm whether turmeric may increase blood pressure but yes it may rectify mechanisms which are lowering BP. Start with small doses such as 1/4-1/2 tsp and if you see no side effects then increase the dose or the frequency gradually to 1-2 tsp 2-3 times a day over a few weeks. Best taken with food to avoid acid reflux. Avoid taking it at the same time when you take other meds. I suggest you read the book by Norman Doidge: The Brain’s way of healing. In the first chapter you will find the information you are after. Good Luck! I take one-fourth teaspoon organic turmeric powder 2 times a day. I found the easiest way to never miss taking it is to take it the same time as my other meds/food. I smear about 1 tsp natural organic peanut butter onto a spoon or little piece of bread or cracker, sprinkle a little heavily with black pepper, and make a little mound of the measured tumeric on top. It actually is it not too weird at first and after a week or so became one of my favorite treats LOL. I also take Ginger every day; I am transitioning from coffee creamers 2 organic half and half with a few cubes of organic candied ginger… No really- think pumpkin spice. I’m working up to 1-half tsp two times a day, with my healthcare provider support to trade out for ibuprofen, which I have been taking routinely for decades due to multiple health issues, including severe osteoarthritis in knees, hands, shoulder, degenerative disc disease, chronic autoimmune inflammatory issues, and fibromyalgia. The dosage of ibuprofen I have been taking is ridiculous 800 milligrams three times a day for over 20 years. I would much rather take too much is one teaspoon a day going to be enough to make up for 2400 milligrams of ibuprofen? 1 teaspoon is a good amount to see results but the results vary from person to person. People take as much as 1-2 tsp 2-3 times a day. Some even take 2 tablespoons or more a day and it suits them. You would have to find out the dose that suits you by gradually increasing the dose such that you would be able to wean off the painkiller. Considering your health issues you might need more than 1 tsp though 1 tsp is recommended max in diet. Turmeric and ginger both work as anti-inflammatory agents so addition of ginger is great. Avoid taking black pepper close to the time when you take meds as it increases absorption of medicines and interferes in drug metabolism. ive been taking turmeric root with ginger, raw honey and lemon everyday.. instead of paste ive been making a tea out of it.. is it safe? doesn’t the turmeric have to be cooked to be effective? Cooking does increase the effectiveness of turmeric and is generally recommended. Hi Irene. Please increase your dose of Golden Paste for 1/2 tsp twice a day is too less. Increase by 1/2 tsp gradually every week till you reach a dose of 2-3 tsp a day. You will observe relief from pain at a dose higher than what you are taking currently. Turmeric milk is also beneficial in reducing pain. Have you had your Liver Enzymes done yet? Starting curry with onion is not a standard. Th North of India does. The Deccan and South of India does not use onion for curry. Uses coconut. Is it safe to take a combination of Crestor and turmeric? I make the paste, allow it to cool, put it on an icing bag the start filling 00 gel caps. Once the caps are made it’s layered with rice in a platic bowls and covered in the fridge . This helps eliminate the horrible taste. I suffer from Fibromyalgia and RA as well as digestion issues and I can vouch this turmeric paste which I then make golden milk with WORKS!!!! I can move much better and it also helps me sleep much better. Look on you tube for how to make golden milk, its delicious! i have made this golden paste and taking with 1/4 spoon in hot water twice daily to see if it will help my RA. i am 30 yrs old. Does it help your RA? nice, however it doesn’t mention how much past to consume every day once prepared…. Taking 1 Tsp 3x daily. Great success with my Fibro and Arthritis pain. Not helpful for my back. How soon after starting turmeric paste did you notice a difference? I’m making my 1st batch right now. Thanks! I have been suffering rhumatoid arthities with low himoglobin level since 5 years..im 24 years old now… as same as i have indigestion problems & gastrities …What is the best combination of mixtures ????? What should i add ingradian ??? What about this mixture ??? Susantha, there is no fixed ratio as such. The recipe above gives you the details of quantities required. You could either include black pepper or thippali, no need to include both. You can add cinnamon powder to the paste too. could I apply the golden paste as an ointment to my topical diabetic ankle ulcer to relieve inflammation instead of ingesting it? Because the pain in my ulcer is very severe at times and I want it relieved as soon as possible. And how often should the wrap be changed and the wound cleaned? I believe any raw honey is good on open infections. Hi Leon. Look into the benefits of activated charcoal. You can mix it with flaxseed and create a paste that you can use on the outside of your body or you can just simply drink it with water. Please stop referring to this as ” MY ulcer”. Please work on getting more in the Light, dear Leon. You are a spirit inhabiting a body, not a body with a spirit. TuermericForHealth here should be able to advice. Using a poultice of turmeric to heal wounds is a time proven remedy. If applying topical turmeric paste do not include black pepper as it will irritate the skin. Conduct a patch test prior. Leave it on for 30 minutes or you could even cover it with gauze and clean after the mixture has dried up say around 2 hours. 2-3 times a day should help. Hello, can i just use regular pepper in stead of black pepper. I grew up learning that black pepper was not good to consume regularly, so i cut it from my meals years ago. Annette – what do you consider to be “regular pepper”? There are many kinds and colors of pepper, each with its own characteristics. While cayenne, (one kind of red pepper), is preferable for some things, if you want your body to absorb the benefits of tumeric, black pepper provides a necessary ingredient to allow you to do that. It does not require much at all. The argument against black pepper originated in the ’60’s because it contains trace amounts of safrole, which was found to cause liver cancer in lab rats when it was injected directly into their livers in enormous quantities. If ingested in large quantities, black pepper, or any pepper, for that matter, can cause GI tract distress, or put stress on the urinary tract or prostate, but what is called for to enhance tumeric is not enough to cause concern. Certainly, the benefits outweigh the costs. Angela, I doubt you would get the benefit from whole black peppercorns that are not ground as they would propab;y pass straight through your body and not digest, most tablets and capsules already have the pepper added, take a look at the label and check, if not just add ground pepper to a meal and take your tablet at that time. Yes you can possibly take blackpepper corns. 1/4 teaspoon of freshly ground black pepper should suffice so in terms of peppercorns it should be 2-3. You can also take the supplements with your meal which would already contain dietary fat and help in absorption. The research which established that black pepper enhances the absorption of turmeric added only 1% black pepper. Your recipe adds much more. It is important that people realize that only a very little bit is required to increase absorption by 2000% (as the research reported) because some people (like me) have a very low tolerance for pepper, but even I have been managing 1%. A question: If I add turmeric to 100 grams of rice, do I need 1% of the turmeric or 1% of the turmeric and rice put together? Another question: It is will established that herbs dissolved in oils can be absorbed through the skin. That would seem to be an ideal way of ingesting turmeric, because it would enter the body without going through the digestive tract and being vitiated there. And then, of course, there’d be no need to add any pepper. Has anyone considered this option? Of course, tumeric is very staining, but it could be done on a part of the body that is always covered by clothing. People do rub it on their skin. Some say not to rub it in open wounds that can get infected, others say they specifically rub it in open wounds to prevent infection. As with anything else, best to test on yourself in small doses/areas. Hi. Could you please elaborate the purpose of using turmeric at exact percentage for rice? For 100g rice 1/2 tsp of turmeric would do. Yes turmeric can be mixed in oil and applied topically. This is used traditionally and also quite some research is being conducted on transdermal delivery of curcumin. I froze it in tiny cube trays. One for me, one for Max, my retriever with allergies. Only on day 2 – starting slow. Question: taking one cube 3x a day to start (1/2 tsp ea). How high should/can I go? Thanks! You can go as far as 1-2 tsp 2-3 times a day. People also take 1 tblsp 2-3 times a day. Marie, yes turmeric works extremely well for pain relief and we are glad to hear that it benefits you. I would really appreciate you giving the quantities. I made the paste, but am having a difficult time gauging the honey, let alone a honey lemon addition – and I have severe pack pain. I did notice on day 1 that my inflammation went down sooooo much that I have wrinkles on my heals, and I can feel when it is time to take more – I literally feel the swelling coming. But I would really love to at least take the edge off my back pain. Thank you so very much in advance. Can you put this paste on a sore ankle to get rid of inflammation? There are cremes available for sore muscles and joint paint…why not? Apply it as a plaster pack using layers of gauze, wrapping it and wearing a sock. Don’t forget it stains. I would also use warmth to help it penetrate quicker (heating pad on top of sock). Can I just heat up coconut milk then add turmeric and pepper then pour in cup with coconut oil and honey? Do I have to make paste? I think the boiling or heating of turmeric is critical to its effectiveness. Raw turmeric does not work I am told. Hence boing first in water then adding milk is better. Yes you apply turmeric topically but skip the black pepper in this case. Doesn’t the cooking of the turmeric remove some of its benefits? yes no? No,not at all. In fact, the heat helps immensely to make the curcumin bio-available. The water is the carrier in order to be able to heat it, as any other way would risk burning it (ie. dry roasting in a pan, or ‘cooking’ in olive oil as I have read somewhere, certainly thought up by a non-cook). The turmeric is not water soluble but the paste is a kind of thick suspension. Adding the oil is crucial as you have learned, turmeric is fat soluble. The black pepper is the catalyst. Yes cooking turmeric may remove some benefits but the curcuminoids remain stable up to 100 degree Celsius. Also whatever gets degraded gets degraded to compounds which also have health benefits. Can you use Young Living Black Pepper essential oil in place of the ground black pepper? I had the same question and will give it a try as I have the oil. The paste may be more palatable without the added pepper and you could take the pepper oil in a capsule form. I think it would be worth a try. Eve, palatable is not the point here. Please have a look at my answer to Rose. If it is piperine extracted essential oil…in theory yes. However, it is a question of how much…one drop? 10? No one currently can answer that. Traditionally, foods, herbs etc were used in their natural form, for good reason. Other constituents work synergetically or buffer. And people are not cautious, thinking ‘more is better’, when this is certainly not always the case in natural medicine. Problems that arise with taking the active ingredient from a herb, and selling it to a not well informed public who often do not take instructions seriously. The best way to understand this is to look up how piperine functions and its effect on the liver, then you will understand why it is important to take it with turmeric, that is so notoriously difficult to absorb. Avoid possible complications and just use pepper as it was meant to be. Black pepper oil does not contain piperine required for absorption of turmeric. Hence it is advisable to use ground black pepper only. When i have powder i make the paste and i really enjoy it with hot milk a few times per day. When im able to get organic turmeric root i dont bother with the paste. Mornings, i simmer a few cups of grass fed whole milk on the stove and put a good amount of finely grated organic turmeric root into the simmering milk along with organic medium to finely ground black pepper and i keep stirring and simmering for 15-30 minutes. I keep it in a large mason jar and portion it out throughout the day. When i portion it out i squeeze it out through a good strainer to get rid of the pulp. David thanks for sharing this. That is a great way to take natural turmeric root. Everywhere I read, you make the golden paste..store it in the fridge…then you use the paste to make a golden milk which you drink. I wish the article above told people to make the milk. Check out wellness mama.. She has a great recipe for the milk! The piperine in black pepper is crucial for boosting the effectiveness of turmeric. Per mug, one does not need much, just a few grinds of the pepper mill. Be sure to use whole milk as the fat is also very important for absorption, it will also coat your stomach and surely lessen or nullify your stomach ache. Actually, in my case, the milk is really bad and makes me feel sick. Hi. here is a separate recipe for turmeric milk. You can take 1 tsp of golden paste and add 1 cup warm milk and a sweetener of your choice, mix and your milk would be ready. Why not just take turmeric capsules instead of using paste?? The additions noted above make the turmeric more biologically available to the body. Capsules (as far as I’ve seen) only contain turmeric. I think the tumeric has to be cooked. Are you saying put the paste in capsules or the raw ground tumeric? There are turmeric capsules that contain piperine now. At your local health food store I’m pretty sure. I make the paste because of the cost, you can buy organic tumeric powder very reasonably where as the caps are just over priced, also i can do more with the paste and only make it once every 2 weeks, it keeps well in the fridge. Steph Harris, I read your comment about making turmeric paste and adding honey & cinnamon to it. I just joined the group to get info on treating arthritis with turmeric. I bought about a half pound of organically grown turmeric powder before I read that the paste calls for fresh turmeric root. Can I substitute the powder for the fresh and still have the potency and efficacy? If substitution is okay, is there a recipe? I could only find the fresh root recipe for Golden Paste. Thank you so much. Becky, the recipe mentioned above involves organic turmeric powder and not fresh roots. Good quality organic turmeric powder will deliver good therapeutic results. Does anyone think this would help for Parkinson’s. Yes research does show that turmeric could have benefits in Parkinson’s though not tested in humans yet. Including turmeric in diet could definitely aid in Parkinsons. I also have fibro and ? RA and or connective tissue disease. Turmeric has anti-asthma property. It helps in relieving pain in fibromyalgia. And it is also proven to outperform conventional anti-arthritic medicines. So its definitely advisable to take turmeric paste. If you plan to take it in capsules, that is very much possible but there are chances that the capsule might melt; so you would have to take it within a short time period of making it. You could make the Golden Paste and mix with milk and consume it. That would perhaps take care of the taste. I make my turmeric paste as recipe then I add a decent dollop of honey and a teaspoon of cinnamon, makes it taste really good, cinnamon is good for blood sugar but will it detract any of the goodness of the paste? cinnamon can be safely added to golden paste. I have a donkey with cancer on his eye lid. Should I put it topically or feed it to him? I have heard that golden paste is also good as an Alzheimer preventative. True? Yes turmeric is good for preventing Alzheimer’s. You can take 1/2 -1/4 tsp of Golden Paste initially and increase the dose to 1-2 tsp 2-3 times a day or how it suits you. Feed it to him and watch his stool. Often times animals get diarrhea when they first start on it, if this is the case lessen the dose. I hope he feels better! I would be careful about using anything in the eye as it can scratch the cornea. Commercial products have to be filtered through minute filters because even the smallest particle can scratch. You also have to be careful with sterility. Do not put exterra paste on the eyeball or on the lid… Omg, what happened to your pony’s eye? Both are advised. For the topical paste do not include black pepper. I just put 1/2 tsp turmeric & 1/2 tsp ground black pepper in 3 large table spoons of peanut butter stir it up good and eat 1 table spoon of it morning..lunch and dinner. with a full glass of water and a reg. size meal… been a few days now…skin feels amazing..over all body feels good…more energy…bad thing…bad breath..Yikes..
Could you do this for your dogs instead of the coconut oil? Instead of turmeric paste, I take apart one capsule of turmeric supplement, add a tsp coconut oil and put it on her food every day. Hi.Black pepper powder is not advised since the active ingredient piperine is volatile and if that is lost curcumin’s absorption will not be efficient. Do you use a good quality pepper mill? Even a coffee grinder or mortar pestle would do. Turmeric paste should be first prepared/cooked with water and then oil should be added as directed above. I’ve just spent an hour plus on this site (and some others), trying to find out how much of the Golden Paste to consume each day! I have gleaned that its best to have small amounts several times daily, and have seen all sorts of “recommended amounts” for cancer, arthritis etc, but some are in grams, some mg, some teaspoons etc. The information is probably in plain sight and I’m missing it! How much of the Golden Paste would be a good theraputic dose for arthritis, fibromyalgia, chronic fatique? And how long on a theraputic amount? I just take half a teaspoon of the paste in hot water at bed time, you can use it in hot milk instead but I find that too ‘heavy’. This keeps my arthritis pain at night at a bearable level. Kim, I came accross 1/8 to a 1/2 tsp. to start. Increasing over time to a teaspoon and so on until you are tolerating it and then increasing dosage to meet your needs. This would include upping the dosage for a few days to tablespoon(s) for curative/immediate pain relief . 1 teaspoon of turmeric powder equals 1.5 grams. The “preventive” dosage is between 1 and 3 grams of turmeric root powder daily in divided doses. The “curative” dosage is between 4.5 and 8 grams daily in divided doses. By a “curative” dose they mean dosages for acute diseases. Diabetes. Cancer. Serious osteoarthritis, etc. The truth is, you can take up to 4.5 grams daily even at the preventative level. It’s a spice, after all. 4.5 grams to 8 grams daily has only been known to after quite a long period cause stomach issues, including at the extreme, ulcers. But, you got to wonder. What’s worse? Out of control prostate cancer or stomach ulcers? Debilitating arthritis or some acid indigestion? Golden milk paste is simmered to a thick consistency with only coconut oil added. So, in this form it isn’t diluted much. I would say 1 teaspoon of golden milk paste is roughly equal to 1 teaspoon dry root powder. Guess you could toss in an extra 1/4 – 1/8 of a teaspoon just to get the full effect. Have just weighed a single slightly rounded teaspoon of turmeric powder from the grocery store which came in a 400 gm bag. I used accurate digital scales and the single teaspoon weighed almost 5 grams. Not to be argumentative but I think your measurement is a little off. I get 1 teaspoon of turmeric is equal to 3 grams. Angie, I have Lyme and a couple of co-infections. Do you find the Tumeric Paste helpful? I made it last week and have been taking 3 tsp a day, along with a turmeric/cucumin supplement. My body feels stronger, though not sure if it’s a result of the paste or the herbs I started taking a couple of weeks ago. Still dealing with neuro symptoms, but see an improvement there, as well. Thanks! flax seed oil, ghee (clarified butter) or UDO’s 3-6-9 oil is best added also (all organic) Best of Health! Same here. Why did you change from teaspoons to ml? Who knows how much 70 ml is? I converted it and got ounces, still not useable. Give the amount of coconut oil in teaspoons, please. Hi. You should start with 1/4-1/2 tsp a day and gradually increase the intake to 1-2 tsp a day 2-3 times a day or how it suits you. Some individuals even consume as much as 2 tablespoons a day so it depends on what suits you. A therapeutic dose would be one that relieves pain or ailment and does not cause side effects. Golden Paste can be taken for life. in regards to black pepper? i read on here that you have to buy the whole peppercorns and grind them right before you make this or it wont be as effective? is this true? i bought some certified organic ground black pepper, will that not be effective? Anyone know what the best kind of pan to cook this in would be? Is metal ok? In cooking Chinese herbs they say to use NO metal. I have been using the Golden paste in my food, 1tsp. in the morning and 1 tsp. in the evening. It has been only about 4 1/2 weeks. So far, I have not noticed anything major, except my skin seems better, brighter. I am waiting for relieve of my osteoarthritis symptoms. Is it too soon still to get results? I also take a vitamin supplement, CoQ10, Fish Oil, Calcium. vitamin C. Vitamin D, potassium.Beta Carotin. and high Blood Pressure Med. I was told I also have Osteoporosis, but I refused to take the med.with horrendous side effects, Plus, I have fallen many times through the years and never have broken anything. I have heard that all those meds are gold mines for the pharmaceutical Co. Should I continue with the paste, I feel it is too soon to get results. What do you think? GP only stays in your body 4-6 hours so it’s better to take it more often and keep the levels consistent over 24 hours. Be sure and take Vitamin K, it keeps Calcium in your bones and out of your arteries. Only use Calcium Apetite for your bones and heart health. The current research favors MK7 over K2. It needs to be taken only twice a week. More is a waste of money. Hi Debbie, can you share your experience with K2, please? I refused to start Prolia and went on my own to start K2MK7 one month ago. No side effects so far, feel well and very active. No health symptoms but lab reports say high calcium and high PTH. Never broke a bone, no high blood pressure, simply no signs of anything. Hard to believe a lab report with no symptoms. Make sure you are taking equal amounts of Magnesium as one balances the other. Do not take them at the same time. Magnesium should be taken at bedtime or with dinner. There is a product called Curcumax Pro that might benefit you greatly. It is by Integrative Therapeutics. I suggest you go off dairy ..worst thing for bones despite the propaganda we have had all our lives..it is made for baby cows not humans and cannot be absorbed. worst still is that it actually leaches the calcium out of your bones as it is so acidic to our system. have almond milk instead it is full of bioavailable calcium. Ernestine, sounds like you need a magnesium spray oil to hell with the Osto. Spray it on your legs before bed each day! It is called transdermal magnesium oil! Works! To “heal” with the Osto! , sorry. Hi Gary, can I get this transdermal magnesium oil at Walgreens? Expand on your experience with this oil, please. You can get it at health stores but I buy magnesium flakes from amazon andake my own. Its easy and so much cheaper. Not to change the subject away from tumeric but you may want to check out info on herbal infusions from Susun Weed. There are a couple of herbs, when used in an infusion (ie. One oz of herb steeped over night in a quart jar and drunk thought out the day) that are helpful for osteoporosis. I think you are right. I, too, refuse to take those killer meds doctors push onto patients who have never fractured. There is a disclaimer on their PDFs which clearly states that any patient who has never fractured should NOT be started on these meds but my endos disregard this warning. Most definitely continue with the Golden Paste. It’s all natural, from God’s hand, not manmade or chemically made. Go to You Tube and listen to the truth about cancer. The results are amazing. There are about 10 episodes. Amazing listening! Whether you have cancer or not, so helpful and preventative for everyday life! You can try and increase the dose of Golden Paste say 1-2 tsp 2-3 times a day if it suits you and see if the pain subsides. Is okay to use the powder from the capsules to make the paste? Yes, why not. Just that it will be an expensive method of doing things. That would be very expensive to do! Better to find an store that sells Indian goods and get a whole bag of Tumeric there. Much cheaper! Would it be organic? I wouldn’t want a product grown with pesticides. I buy from Mountain Rose Herbs. wildcrafted, organic, sustainable, fair trade. GREAT products! if you dont mind overspending and as long as you onky use the powder and dont include the gel caps. i know of someone who threw the whole capsules! that was totally damaged and wasted! Golden paste is designed to be made using whole turmeric or curcuma raw or powder…curcumin is a main component of turmeric and account for aprox 3% of turmeric. You can do that but it is preferable to use organic turmeric powdr since it has more than just curcumin. You can first make the paste with turmeric powder, cool it and then add the capsule powder if you wish. I have been using Golden Paste with my dogs for the last 6 months or so, my oldest 11 yrs had horrid dry skin so bad it was raw and what I would consider to be cysts or moles that would open and sometimes bleed. Now she’s got her fur back, not itching as much, cysts have either gone away or not bleeding any more and shrinking plus she acts like she’s 8 again, playing and running. Hi Bill, this is fantastic! Thanks for sharing your experience with paste with us. Sharon – Just FYI, you might look at the pet food. My dog had seizures and was on pheno for a long time (and still had seizures even when on the meds). An acquaintance mentioned that their dog had previously had seizures and they found it was related to the food he was eating. Low and behold, I was feeding my pup the same food (Purina crap / Beneful). Once I took him off that food and went basically grain/preservative free he stopped having seizures and was seizure free for the remainder of his life (5 yrs). Good luck. Thank you for sharing this. We are glad to hear that turmeric benefits your pets’ health. Hi… apologies if this was asked before, but there were a lot of comments to skim through! What about fresh turmeric root? My local store sells it, and I was wondering if I could simmer slices of that with ginger -and would it be as effective as the powdered or paste? Thanks for posting the question about fresh turmeric root. I, too use the fresh stuff and either grind it myself or rely on a local organic farmer to grind it. Seems it would be much more potent than the dried stuff (but who knows?). It would be effective but the only problem is that you would need large quantities of turmeric and the fibres of the root would make it slightly less palatable. Is there any harmful effect on the kidneys for someone who has had a radical cystectomy? RC = removal of the bladder resulting in a urinary stoma. I’ve been making this paste for a year now I add it to a freshly squeezed lemon juice and add water in a pint glass. It looks like orange juice. I am totally pain free from arthritis and sciatica. Who knows what other diseases it’s prevented me from getting as I haven’t been ill in all that time not even the yearly dose of flu. Love it. Jan, how much of the paste do you put in what quantity of lemon juice AND how often per day do you take/drink it? I made the paste for first time, I find it is grainy when I put it in a drink? Have I maybe not cooked it enough? Yes turmeric is effective in ameliorating pancreatitis. You can start with 1/4 to 1/2 tsp a day and then gradually increase to 1-2 tsp 2-3 times a day or how it suits you. Best taken with meals and avoid taking it close to other medications. Do you have to cook the tumeric in water or can you just heat it in coconut oil and add the pepper to it? Is the cooking necessary? Cooking increases absorption of turmeric and the water is to ensure good consistency of the paste. You’re right. I had severe shoulder pain from a vehicular accident in 1998 in spite of continuing therapies and pain relievers. Fortunately, I learned about turmeric about 2 years ago and since then, I have not felt the pain anymore. . This is great. Thanks for sharing. How are you taking turmeric? as golden paste or powder ? This is a little crazy making. I did not use peppercorns, it says ground pepper and that is what I used. It turned out good. I also would like the use of teaspoons/tablespoons/cups, instead of ml. Does it matter if I use Golden Paste or powder? I just found this site, hoping turmeric will help my palmar plantar psoriasis, it has gotten bad. Some times I cannot stand to be on my feet and my feet and hands peel, crack and bleed. 2 days ago I started mixing 1/4 tsp ground turmeric, l tea. coconut oil and a shake of black pepper, stir and add 1/4 cup milk kefir, stir real good and drink. Doing this 3 times daily and pray. Sure hope it helps. Has anyone ever heard of turmeric helping with psoriasis on feet and hands? As long as you are using something to absorb turmeric, its fine if you just use the powder. Turmeric benefits in skin disorders and also in psoriasis. There is no hard and fast rule to take turmeric – you can mix it is whatever you want just these guidelines 1) Use best quality ingredients 2) do not take more than 1-1.5 tsp per day of powder, start slow and then increase to this max dose 3) best to have this after food as turmeric increase acid formartion and thus some people may have stomach issues. 3) you need to take black pepper and fats along side to ensure its absorbed. I understand the need for the black pepper, but my husband is allergic to it. Any suggestions? You could skip the black pepper in Golden Paste recipe. Oil also helps in absorption. Or you could use ginger powder instead. I put 1/2 t. in my coffee in the morning 1/2 t. in my tea at night. When I’m rushed I down the 1/2 t. with some water. Hi I’ve been mixing 1/4 spoon of Tumeric, 1/8 of ground pepper,1/8 of ground ginger, 1/8 of ground cinnamon , and 1 teaspoon of coconut oil . First I mix all the above in a glass then add lees than half acup of oj is this considered a good mix and if I add cumin would I be mixing too many spices? You need to get whole black pepper corns and grind it just before you put it in… Or it won’t really be effective. Hi Mary Jo, I do the same. What are the amounts of each ingredient you use? I harvested several kilos recently from just a couple of pieces I stuck in the garden a year or so ago! Froze some, fermented some, and gave a lot away. That was before I knew anything about it except that it’s good in curries, along with many other healthful spices. How much of this should you take each day? Eddie! Where is “Banora Point”? (what kind of climate?) What time of year did you plant it? harvest it? Thanks! Can I use grated fresh termeric rather than powdered please? yes! infact fresh turmeric has constituents which are lost when you make powder. Wondering how this might work for an infection with edema. ..thoughts? I have Hemochromatosis it is a genetic disorder that causes me to have too much Iron in my body. I stumbled across a Natural Doctor through a web search that has Hemochromatosis as well. One of the things he gave me to use was Turmeric Cream. After literally a dozen doctors and with no results or help from any of them until I went to this doctor. I don’t know which of the 4 things specifically helped me the most but what I do know is that every time I run out of the Turmeric Cream I start feeling bad. I tried to make my own cream once but all I did was add Turmeric to some melted Coconut oil. Needless to say that was a mess:) I am going to try to make this cream and see how it goes but judging from the pictures this will work better than my first attempt at making a cream. where do you get the Turmeric Cream you have been using? Is it something to use topically/on your skin? If you liive in Perth Western Australia then I suggest you contact Mr Alexander Ring at Mounts Bay Physio, he fixed my 43 year old daughter who has suffered all her life with vertigo also my 90 year old father plus of course me. I was losing 4 weeks pay in one stretch every year and had many single days of work as well. He is called a vestibular physio. Have you researched vertigo? If yes, then you’ll know why it happens. If not then do so. No medication works because of the nature of the problem. I hope you find a physio that performs the procedure, I believe in America the doctors also treat vertigo in the same way. Good luck, it’s a terrible condition to live with. Thanks for sharing your success with us. My brother healed his carpel-tunnel syndrome with daily turmeric after his doctor recommended surgery as the only way to alleviate his symptoms. He has consumed turmeric daily and symptoms have not returned after several years. Great to hear about this success with turmeric in carpel tunnel syndrome. Too much woo here. You people are nutz. if you suffered horrible pain and found a alternative to toxic medications…… you would woooo too! Exactly I suffer from chronic RA & am keen to try the turmeric golden paste to see if it will help me . Lord knows the things I have tried over the years to no avail . the pain is so debilitating & depressing . Go to the doctor and get you some Woo! Its an expression in a vernacular reflecting the maturity of the user lacking intellectual eloquence; an example of having been dumbed-down. If I “woo” your comment, does that mean I like it? WOO!!! WooHoo! dumbed down version of Sweet! Excellent! Finally something to look forward to? Ok! That works – I am going to try this for the Rheumatoid my body suffers from. I am looking forward to it working, the toxin removal did not help…… I will try anything (nearly) to get away from this debilitating pain which I consider stupid – the pain that is. I have been given an alternate combination including 1tsp cinnamon at thee end with the black pepper. Yes, it is. Normal powder used as spice. thank you very much. Is there a chart on how much to give a dog or person because i am thinking about trying it for my aches and pains. I make a tonic that I would like to make as a paste instead. Is there any reason why these ingredients shouldn’t be incorporated together: All organic – coconut oil, Bragg’s ACV, lemon juice, raw honey, Ceylon cinnamon, ground ginger. ground turmeric,fresh ground black peppercorns, Cayenne pepper ,purified water . I will follow the recipe but with these ingredients. I used this as a poultice on a spider bite~ drew out the poison in 24 hours. AMAZING!! It is honestly the best! I use turmeric in my cooking, give it to my dogs…can dye my t-shirts with it…it is incredible! What kind of spider? How did you get it to bite you? If I make paste, how much ceylon cinnamon can I put in? Or should I not put it in the paste itself? Why do you have to ‘cook’ it? I myself have asked the admin here for reasons why turmeric needs to be cooked. He said something about needing to research it more, still waiting. Hi, thanks for the wait. I have been trying to establish that heating turmeric does not cause problems in terms of its properties. Most research says it does not but a few say it does. I plan to publish a separate article on that soon. But the moderate / short time heating is not going to cause any problems. Also – turmeric need not to be cooked as such to get its benefits. But as its a spice its always been related with cooking. OK. Well, there are studies that show it does need to be heated and when I asked at a Facebook group about juicing raw turmeric, I was told it would not be effective unheated. What do you think? I have a guess that when you heat the tumeric, all the toxins are released; however, that’s just a guess. Yes! start with 1/4 tsp of turmeric. It may take time. But based on other experiences you should see a difference in 1 months time. Also, you can slightly increase the dosage if its possible to do so. Thankyou and i have increased the dose to 1/2 teaspoon and will try 1 full teaspoon next week and stop there as that seems to be the max dose. Thankyou for you advice, we see a difference already, hes just happier, playing with the other dogs something he had stopped doing.. Thanks. Hi again…how do you make your turmeric milk Keshavk?? Yes, I give it to my dogs with olive oil. It has so many health benefits for dogs and humans! Do the dogs also need the black pepper to make it effective, and if so, do they tolerate it? Yes dogs also need the black pepper and they do tolerate it well. If you feel that your dog is not comfortable with the black pepper you could skip it and only use oil to increase absorption of turmeric. Can you specify on how to take the right dose of golden paste? A teaspoon? Half a teaspoon? How many times a day? Thanks! there is no set dose. but a good ex is a quarter teaspoon several times a day. Do you use the numeric from the spice isle or fresh whole turmeric root? It needs to be ground organic. I order mine from Frontier coop. Some Health food stores might have it. Probably wont find it in the regular grocery store. Buy in bulk. Is turmeric “powder” the same as the turmeric I buy as a spice? Thanks! You must make sure that it hasn’t had it curcumin removed. Usually contains 3 to 5%. That’s the active ingredient. If your on Facebook, join Tumeric Users Group;-) All the info is there. Turmeric Users Group on Facebook is a Fantastic group! I love this group too! Thanks for all the valuable information! Good morning, thank you for this great website. I’ve started using the golden turmeric paste 3 weeks ago and last week my shoulder/arm pain stopped! But in the weekend I got ill and was wondering if it was the turmeric as my stomach was very funny. I stopped taking it and the pain in my shoulder/arm is back! So back on it as I’m sure I had a bug and it had nothing to do with the turmeric. But what is the right dose if you use the golden paste recipe? Twice a day 1/2 a teaspoon? Thank you! I have a 4year old American Bulldog that was just diagnosed with cancer. Although, after surgery he is in remission, the cancer cells are very aggressive and 2 vets were only slightly optimistic. He started chemo 2 weeks ago and I’ve been making the Tumeric paste (I add raw honey to the mix, I just eyeball it) and put it on his food. The vets were very concerned about his white blood cell count. I got a call today after the vet drew my dogs blood Tuesday, that he is doing GREAT. She, the vet sounded very optomistic. I’m not one to necessarily believe in miracle cures, but for now, he’s doing great and I’m going to start putting it on my food also. For those that want to know, he weighs 104lbs and I drizzle 2 tablespoons over his food, warmed up slightly in the microwave. Hi Gina, this is awesome. Hope he will recover fully! Hi Gina, congrats with the great results! I have a slight remark, heating the food/tumeric up in the microwave will destroy a lot op the “power” it’s better to heat it another way! Microwaves are a waist of almost every vitamin or mineral and really should be thrown out of the kitchen. Good luck with your dog, I hope he’ll be okay and gets better soon! Hi Karin. please scrub it / peel it. Some people do use the whole too. You really need to wash them properly if you plan to use them as whole. You should buy Organic Ground Tumeric from a reliable source. Make sure the curcumin has not been removed. If You are on Facebook join the group Tumeric Users Group. Very helpful. Just wondering if a side effect is itching? My 10 year old dog has been very itchy for the past week or so (we started GP on May 16). She also has the “cat pee” smell even though I’ve added the Ceylon cinnamon to my last batch as well as have given her a bath. So, I’m curious as to whether she should be taking it (I’m hoping she can as she has degenerative disc disease and we are keeping an eye on her thyroid due to high levels and nodules (possible carcinoma)). Thank you. Hi Jude, I am not sure about pets. But I can refer to this awesome FB group – Turmeric for Health – It has around 85,000 members. Has super helpful admins and is more oriented towards pets and turmeric. I have been taking 1 t. of tumeric paste (1/2 t. in the am and 1/2 t. in the pm). I put it in my coffee or tea with some honey and creamer. It has taken away my shoulder pain and I no longer take Mobic. Turmeric is a wonderful anti-inflammatory spice. I intend to take this for the rest of my life. Is that okay??? Not even okay but it is what you should be doing! Turmeric is not like modern medicine – which needs to be taken after you have a trouble. It is most effective to prevent health issues. Great Angie, how do you use it? I mix 1/2 tsp of turmeric with 2 tbsps. olive oil. I am interested after having read so much info about the GP…with pepper etc. How do you use it? I read somewhere that you can add honey to Tumeric paste. Anyone tried it? Yes you can. Please use organic honey, especially manuka if possible. How do you make the milk? I make Turmeric paste with Turmeric powder, coconut oil, raw honey, freshly ground pepper and quercetin powder. Roll into small balls, freeze on a tray and then place into a ziploc bag, Always available to me, don’t go bad and they taste great! Great idea . Can you give me an idea of the amounts you use for each ingredient? can anyone advise the best Coconut oil to use please. Hi, any certified virgin coconut oil should do. Good point, Agreed. Virgin coconut oil is a marketing term. In case of organic too, please make sure it is certified organic and not “self proclaimed” organic. You need to use UNREFINED Organic Coconut oil. Yes it should be cold pressed, organic extra virgin coconut oil. Not possile to cold extract coconut oil. Coconut milk is extracted by heat and coconut oil is skimmed from the milk.Most manufacturers have a you tube link, go watch. How does turmeric essential oil compare to the actual herb? how much is 70 ml??? Not sure if this helped. Let me know. Thanks Heather for insight. My bad. I was just thinking it based on my place, here coconut oil is almost always liquid (except maybe 1-2 months). I can relate. I live in the NT and my coconut oil is almost always liquid. Feeding a tumeric oil and pepper mix to a horse with sarcoidosis at the moment. Horseland stocks bags of tumeric much to my daylight! Yes, as it improves absorption of turmeric. When making my first batch of golden paste I goofed and put the pepper into the water at the same time as the turmeric instead of when the cooking was over. Is there a reason for holding back on the pepper until the end of cooking? I’m asking because I’m not real happy with the paste and had to add a lot of honey to be able to eat it. As such there is no issue in that. The taste of the paste will have to be improved by hit and trial 🙂 Best part is you can always add things you love to make it taste better. What is “cold pressed” olive oil? Will extra virgin olive oil work? 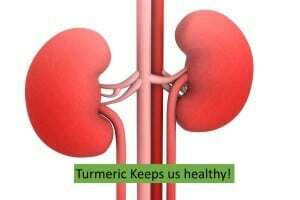 Can you tell me what the benefits are of making turmeric paste? Why wouldn’t we just use turmeric powder in whatever we are cooking? I can’t find an answer as to why one should make the effort to make turmeric paste. Good question. 🙂 I guess the answer lies in preference. Why some people want to eat raw apple and others as juice. In India, putting raw powder is prevalent and most of us never think of making a paste. But as turmeric’s popularity is increasing so are its ways to take. Further, in paste form you also add black pepper, and maybe healthy oils in it. Which can improve its overall benefits and bioavailability. but yes, if you are already taking turmeric powder in your diet it does not matter in what way – its fine! when measuring out the cocnut oil do i dissolve it first or just put the set oilin if so what weight ? Carol, I did not get you. Can you please elaborate. If I might clarify the question, we would like to know when measuring the coconut oil should we in the US first melt it into a liquid, or put the solid form as it is sold here into the measuring cup? You can melt coconut oil prior to use and measure it in liquid form. Hi, the process is just the same, just make the paste of the root, no need to boil water. Just mix all ingredients. I would make small quantities of the paste so that it can be consumed in 1-2 days. Just that it may taste a bit different than powder (infact it tastes better :)) . Make sure you take care of the max turmeric dosages while making it. Thanks, but what do you mean by, take care of the Max turmeric dosages? Hi, I am sorry, probably being stupid here, I’m confused how do I make a paste of the hard root? I have the root and I have never made GP before, I don’t want to get it wrong. Thanks in advance.